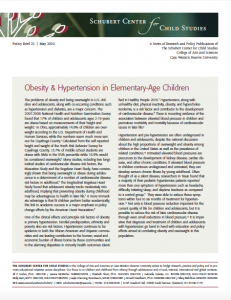 The problems of obesity and being overweight in U.S. children and adolescents, along with co-occurring conditions such as hypertension and diabetes, are a major concern. 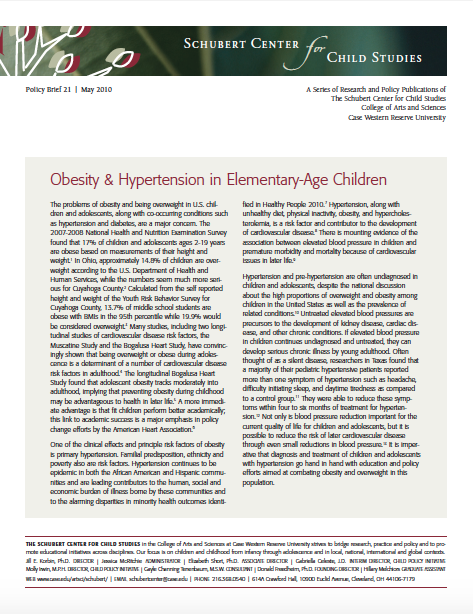 The 2007-2008 National Health and Nutrition Examination Survey found that 17% of children and adolescents ages 2-19 years are obese based on measurements of their height and weight. In Ohio, approximately 14.8% of children are overweight according to the U.S. Department of Health and Human Services, while the numbers seem much more serious for Cuyahoga County. This policy brief highlights the findings from a 2005 research study conducted as part of a comprehensive partnership between Cleveland Metropolitan School District (CMSD), the Francis Payne Bolton School of Nursing at Case Western Reserve University and the American Heart Association. Approximately 200 children in the 7th and 9th grades received routine state mandated health screenings measuring the students’ height, weight, and blood pressure.